Have fun with play-doh while learning math and science! 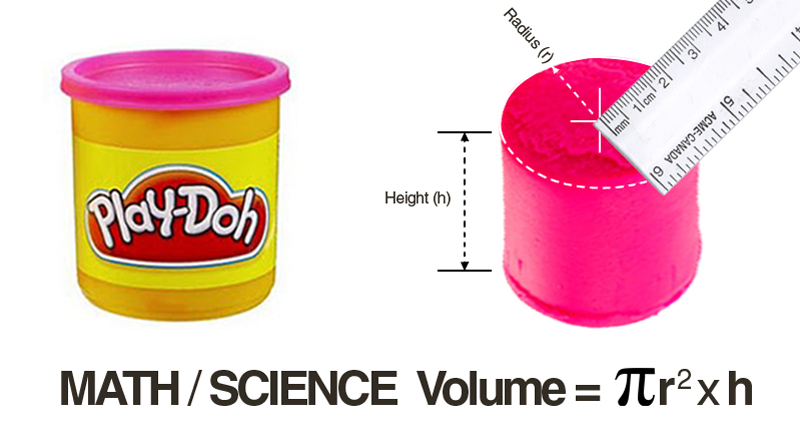 First, make a hypothesis and a prediction, will the volume or weight of play-doh change after it is played with? Ask kids what state of matter does play-doh belong to? Is it a solid, liquid, or gas? If play-doh is smushed, is that an example of a chemical or physical change in matter? Explanation - Changing the shape and form is an example of a physical change in matter. Play-doh can take on many forms and return back to its original form. 1. Take play-doh out of the canister and keep it in its cylinder shape. Now, find the radius of your circular base. Then, measure the height of your cylinder. 2. Figure out the volume! 3. Have fun with your play-doh, mush, smash, roll, and bend it for at least 10 minutes. 4. After playing with it, return it back to its original state by putting it back into its container. 5. Once it's a cylinder again, take its measurements and find the volume. What happened? Is the volume still the same? Experiment with finding the volume of various 3D play-doh solids (cubes, rectangular prisms, etc.). Visit UEN or Science Buddies for instructions. Weigh play-doh before and after playing with it. Did the weight of the play-doh change? Weigh the play-doh in a variety of shapes and irregular forms. Does shape make a difference in weight? 1. Measure the length and width of play-doh straight out of the canister. Create play-doh shapes and sculptures and measure. Compare your measurements to the dough straight from the canister. See who can make the longest piece of play-doh using only one canister of dough. Combine your play-doh snake and measure! 2. Use play-doh on ten frames. Kids pinch off pieces and roll pieces into balls to represent numbers on a ten frame. 1. Make an electrical circuit with play-doh, while learning about insulators and conductors! 2. Visit Andy Brain for a play-doh buoyancy activity! Wow!! I must say and I am here to discuss about trapezium,A trapezium has no parallel sides and any quadrilateral drawn randomly would probably be a trapezium and if the quadrilateral had one pair of parallel sides then it is a trapezoid and if both pairs of sides are parallel its a parallelogram.